It’s that time of year again! 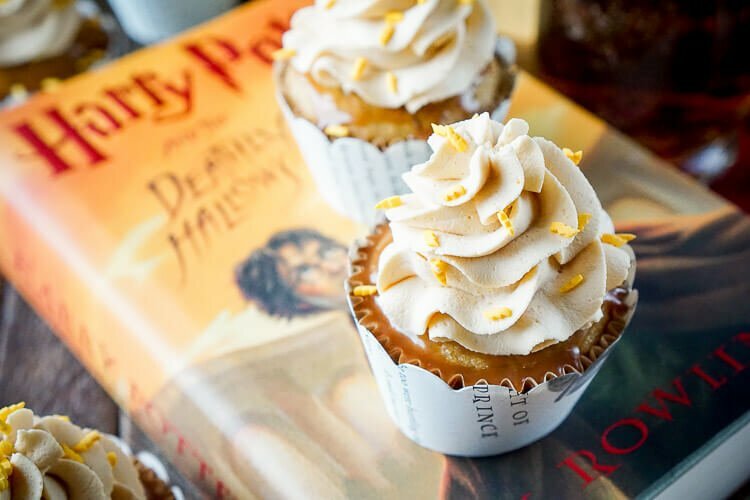 Every December, Matt and I have a Harry Potter marathon, I don’t even remember how long we’ve been doing it, but I always try to bake up something delicious for us to enjoy with it! 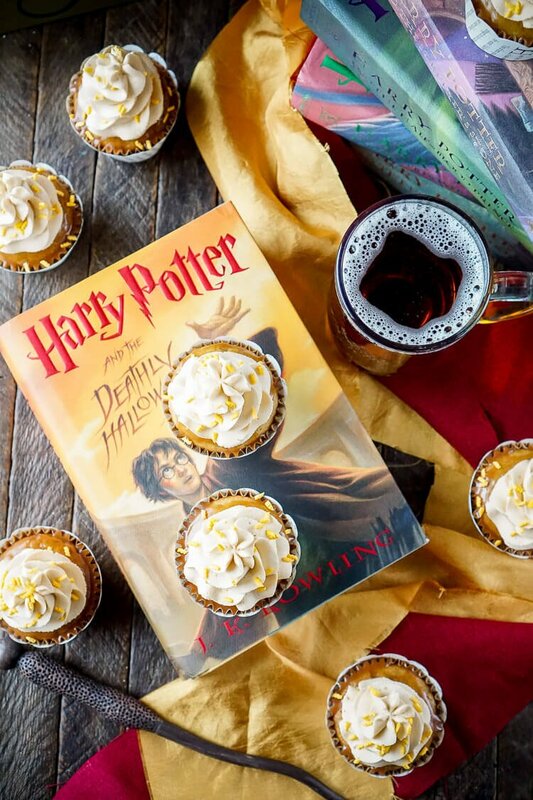 Last year I made these Butterbeer Pudding Cookies and they’ve been one of my most popular recipes to date! We’ve made them over and over again, tried different variations and I even made them for a wedding in September! One reader is commented that the cookies “smell like unicorns,” here’s to hoping these cupcakes are just as good! Buy Harry Potter Cupcake Toppers! 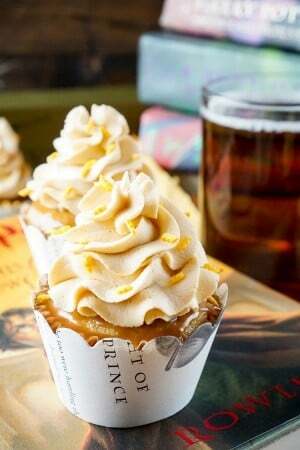 Harry Potter Cupcake Liners!Buy Now! Edible Lightning Bolt Cupcake ToppersBuy Now! 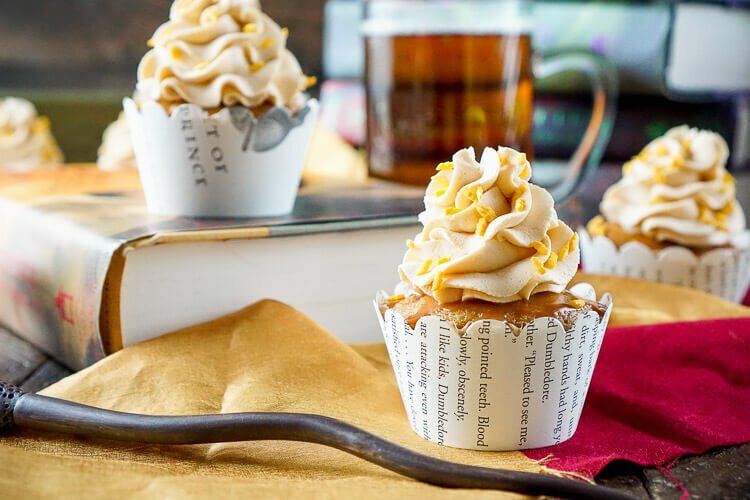 Personally, I think they’re freakin’ amazing and might just be the best cupcakes I’ve ever made, they taste like french toast and butterbeer had a baby! See, now you really want one! Buy A Cute Harry Potter Apron! These cupcakes are light and fluffy with toffee bits throughout that make for a nice little punch of flavor. Then they’re dipped in a rich butterscotch sauce and finished with a whipped butterbeer frosting and some lightning bolt sprinkles. I know there’s a fair amount of people who don’t like to use flavoring or extracts, but please be aware that the butter extract is KEY in this recipe and CANNOT just be replaced with melted butter. You can find the imitation butter extract in the baking aisle with other flavorings, extracts, and food colors. So Harry Potter lovers, are you guys excited for the Fantastic Beasts and Where to Find Them movie? I know I am, anything to keep the Harry Potter universe alive, right? The trailer comes out next week and I’m pretty pumped, especially because I adore Eddie Redmayne and know he’s going to do an amazing job! Also, have you guys picked up a copy of the new Harry Potter and the Sorcerer’s Stone: Illustrated Edition? It’s absolutely gorgeous and I can’t wait to start collecting the books all over again! Buy The Illustrated Harry Potter Book! 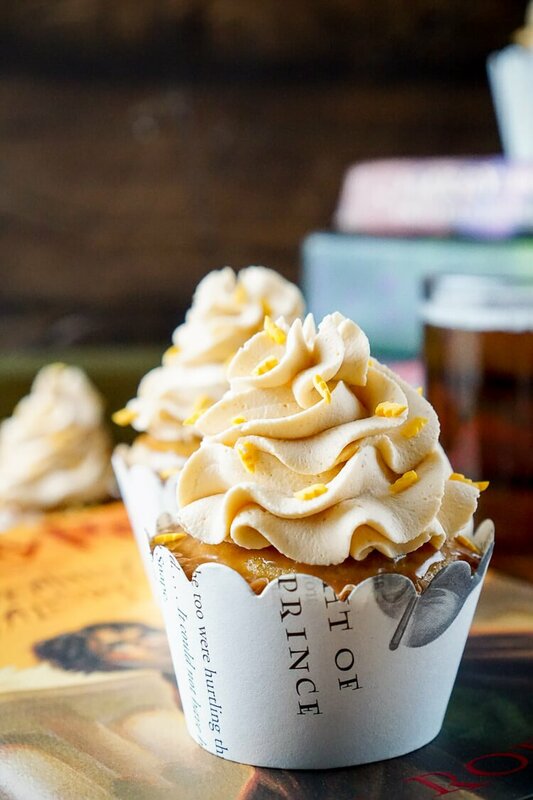 I purchased the Harry Potter cupcake liners on Etsy and put them on over the two regular liners so the sauce wouldn’t make them all nasty. They are made out of copied book pages, and as a book lover, they were just too perfect. The lightning bolt sprinkles used in the photos are no longer made, but you can find some similar ones here. You could also top the cupcakes with sugar lightning bolts. 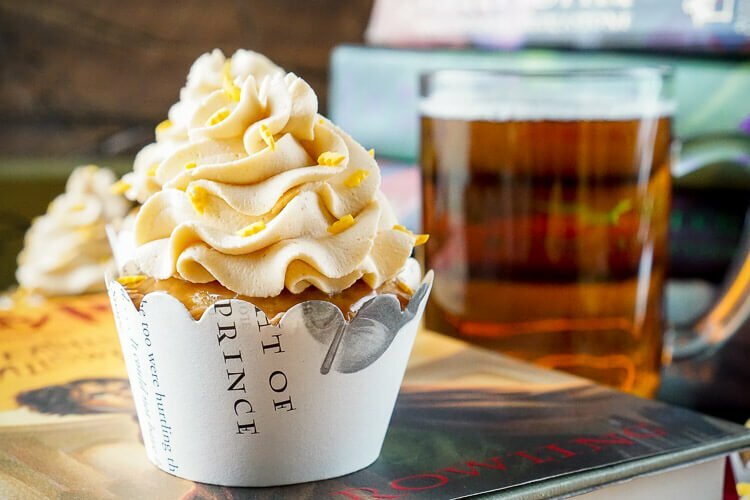 Buy Harry Potter Chocolate Molds To Top Your Cupcakes With! Check out more great Harry Potter Creations! Accio Coffee Mug <<< My favorite mug! 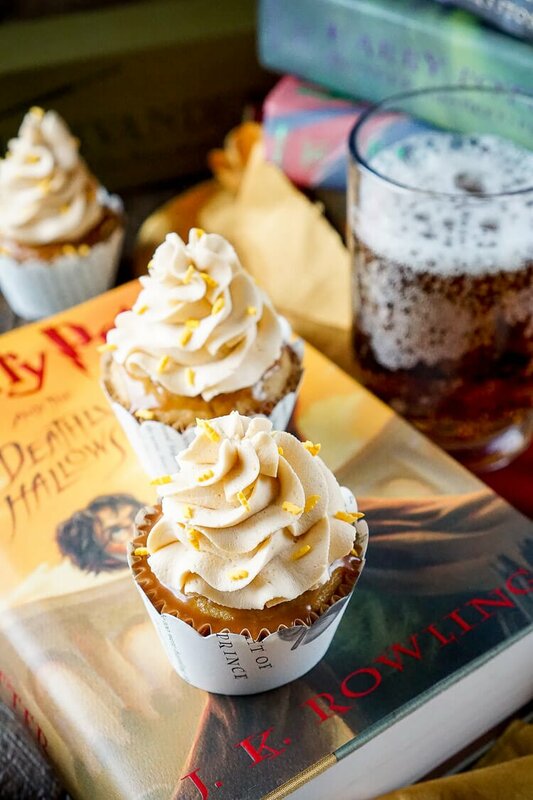 Pin these Butterbeer Cupcakes for Later! Watch how to make these cupcakes below! Your recipe for the frosting is missing something. I ended up having to add a 1/2 stick of butter to firm it up. Your directions made soup. Hi Katie, there’s no need to add butter to the recipe, it’s a whipped cream frosting, you need to whip the cream until it turns into whipped cream. I know. I woke up in the middle of the night and was like OMG it’s whipped creme. I had a moment ~ so sorry. How well/long does the frosting hold up? Thank you! Hi Timarie, It is best consumed the day it is made, but you could make it up to 24 in advance and make sure to store it either in the fridge or in a cool area of the kitchen. I made this for my husband’s birthday. They we’re delicious! The frosting was amazing! Thanks for sharing a great recipe! Have you ever tried this recipe as a cake? If so, do you know cook times and if the recipe needs to be altered at all to keep it moist? I just made these and they turned out delicious! I accidentally mixed the butterscotch chips with half n half… lack of sleep I guess! But the sauce still turned out amazing. These cupcakes are fantastic. Now I need to figure out what to do with all of them since I baked them on a whim and it’s just my husband and I. I guess I’ll bring them to the office in the morning and be everyone’s favorite or most hated (dieters) person. So glad you loved them and yes, they will both love and hate you haha! Made this for a Harry Potter themed baby shower and several people said these may be the best cupcakes they’ve ever had. Delicious! I ran a little short on time, so ours were without the the sauce, and we sprinkled butterscotch candies crumbled on top of the frosting to get the golden yellow effect without the sprinkles. Thank you for helping make so many people happy by sharing this fantastic recipe! What a great theme for a baby shower! I’m so glad everyone enjoyed them and I hope you get the chance to make them again! So glad everyone enjoyed them! Sounds like a class I’d actually want to be in! I made these for my son’s family party. I honestly was making them because I was intrigued, but figured that most of the family would be turned off by them. I froze half of the cupcakes and frosting to take out later because I didn’t want them wasted. My niece is a huge HP fan, but has told me she doesn’t like butter beer. She tried these and was in heaven. She said these were her new favorite dessert, and has asked me to make them for her birthday. Everyone else agreed, and all the cupcakes I put out were gone. My husband was disappointed he didn’t get to try one. The cupcake portion itself is delicious, and I personally found I could eat it ‘naked’ as a breakfast muffin. I was worried it was going to be too sweet once I dipped them in the butterscotch, but the whipped cream topping really helped tone the sweetness down so it’s a great balance of flavor and not over powering. A huge hit in our family. Thank you for sharing! I’m so glad everyone loved them, Jen! How did they freeze? I’ve never frozen them myself, but might be helpful to other readers who want to make them in advance. They froze really well. When I made them, I made the cupcake part and I dipped them all in the butterscotch sauce. I froze them in a Rubbermaid Take along container. I froze the remaining frosting in a separate container. I defrosted the cupcakes on the counter, and let the frosting defrost in the refrigerator. It all tasted just as good as where the week before for the family party.